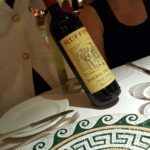 It was our third cruise on the Caribbean Princess before I discovered the Chef’s Table. We had been on many cruises, tried all the specialty restaurants, but were now only discovering the Chef’s table. So, on the first day of the cruise, I called the front desk, asked a few questions and signed up to participate. I think the word foodie is way overused, but let’s face it, that is what I am. After a wonderful day sightseeing and sunning in Aruba, we returned to the ship to dress for our dinner. We met up with four other couples who turned out to be delightful dinner companions. We were introduced to the very personable and entertaining Executive Chef Thomas M. Ulrich. 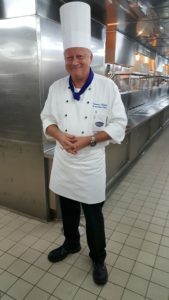 He ushered us through the ships galley to experience how he directs two hundred and fifty plus people to prepare and present food twenty- four hours a day for thousands of passengers. We realized immediately, it was quite a feat! It was time to begin our meal and we were all anticipating the experience. As we were led to a cozy corner of the kitchen, an aperitif and amuse bouche were waiting. The aperitif on this occasion was champagne, which was of course delicious; and the amuse bouche, four bite size hors d’oeuvres, was beautifully displayed. 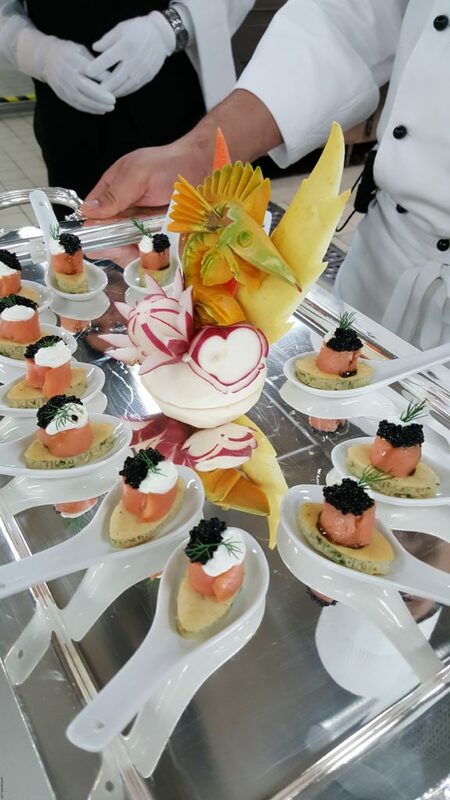 Amuse bouche is a French term used to describe small bits of food served before the meal. Both the aperitif and the amuse bouche are to stimulate the palate while representing what to expect from our upcoming meal. I personally would call both, happy food! 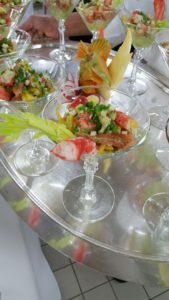 And happy we all were as we savored a Blini pancake topped with Smoked Salmon and Caviar, an Ahi Tuna Tartare with avocado, soy and ginger, a Gruyere Tartlet and a Blue Crab Margarita with avocado and mango…..and the champagne was flowing! A grand meal should entice all the senses and we were not disappointed as we approach our table in a main dining room. The table is laden with flowers from end to end and our glasses are filled with an excellent Sauvignon Blanc. The starter was a porcini and morel Mushroom Risotto. Risotto is an Italian cooking technique that involves stirring hot liquid little by little into Arborio rice to create a creamy consistency. With the addition of the mushrooms, this dish was outstanding and a favorite of many at the table. The Intermezzo was next, a course to cleanse the palate for the entrée to follow. 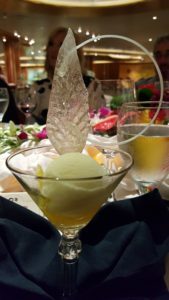 It was a Citrus Sorbet laced with frozen vodka and its taste and presentation had a wow factor! 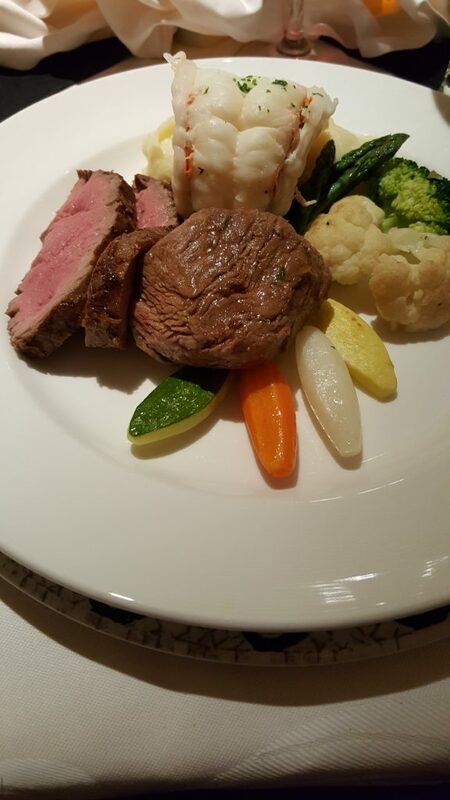 Our entrée was billed as the “ultimate surf and turf.” Slices of Bourbon marinated beef tenderloin shared the plate with a broiled lobster tail and veal tenderloin medallions. A béarnaise sauce, a chili sambal and drawn butter accompanied the plate. Root vegetables and mousseline potato compliment the meat and seafood and a Chianti red was served with this course. We were all sated; but we know there was more deliciousness to come. The order of the meal is following the French tradition and a tasty cheese course is placed before us. 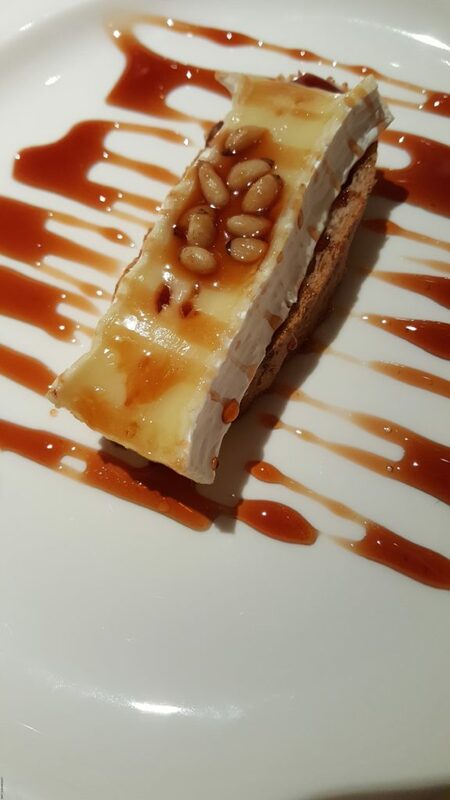 A wedge of creamy Camembert with pine nuts sits atop a crisp walnut biscotti. The dish was drizzled with a port wine reduction. crunch. 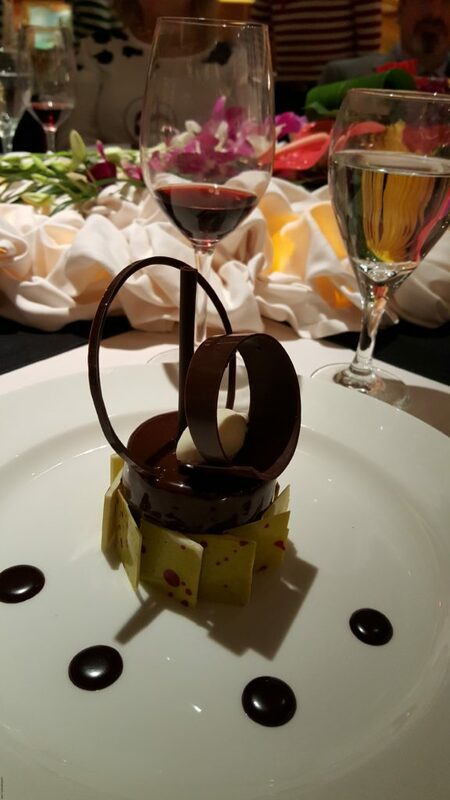 The artistry of this creation was as special as its taste. A dessert wine was poured. Our tummy’s were about to scream “uncle” when Chef Collemi returned. Just as we began our meal with the amuse bouche we were going to end our meal with mignardise. Mignardise refers to an assortment of small desserts typically served with coffee at the end of a meal. 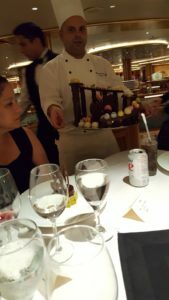 Chef is holding a carousel made of chocolate. I thought this is over the top! It contains one more glorious opportunity for us to savor an amazing assortment of handmade macaroons, candies and chocolate. Mignardise is an assortment of small desserts typically served with coffee at the end of a meal. We left the table having met new friends with common interest, hoping we would meet again. Thank you to the Chefs who prepared our meal and the experienced and attentive servers. Thank you Princess for offering the Chef’s Table. It will be a while before we forget the delicious memories we are taking home. This dinner sounds spectacular! Do you know if only certain cruises offer it? I would ❤️ it, too. The dinner was fabulous! I believe it is offered on most Princess ships. What I do know is that the moment you get on board, you must sign up. It fills up very quickly and only takes five couples.